For deaf people, our eyes and hands are our most treasured assets. So when the vision in my right eye began behaving strangely I became anxious. At first it seemed that I couldn’t see quite so well and things sometimes appeared a bit blurry. So in September last year I had an eye check-up. The optometrist, Kate, told me the vision in my right eye had worsened slightly and I have early stage cataracts in both eyes. It would be many years, she said, before the cataracts became a problem and would need to be removed. So according to Kate, nothing unusual was happening. Afterwards I said to my hearing husband John, “I don’t think she understands how much I depend on my eyes,” although I had mentioned it to her. My new glasses didn’t seem quite right. I couldn’t see quite as well as I thought I should. I thought Kate’s idea of ‘bad’ cataracts must be quite different from mine. John and my mother both thought I should see an eye specialist. “They might do cataract surgery earlier than usual for you,” Mum said. I worried about macular degeneration, which I knew leads to blindness. I told myself to stop being hypochondriac. I dithered, feeling bad about insulting Kate by requesting a referral. Straight lines began to look wavy. When driving, I couldn’t tell if speed signs were 60, 80 or 90 until I was very close to them, and dark coloured cars were hard to see. Reading became more difficult, people harder to lipread unless they were close. Then one morning I saw black squiggles that became cobwebs moving on my eye. This was definitely not good. A Google search told me it could be a common and harmless ‘floater’: a bit of vitreous gel that breaks off and floats across the eye; or it might be an emergency, a retinal tear. I sent John a text at work and we decided to ring Kate and ask what I should do. She told me to come in immediately. John left work and came with me. After various tests, Kate said my left eye was the same but in four months my right eye had deteriorated by two lines on the eye chart! The cataracts were unchanged. Although the cobwebs could be a sign of a retinal tear, she couldn’t see any. But there were two small bleeds near the optic nerve, which she showed us on a photograph. It was obvious I needed to see an eye specialist. Kate made an appointment for me for an hour later. Dr V’s schedule was full, but if I needed treatment they would squeeze me in. In the doctor’s rooms, an optometrist, Paul, did more tests, took more photographs, and a doctor told me I had a hole in the macula of my right eye. John and I looked at each other, shocked. Was this macular degeneration? “It’s not bad,” the doctor quickly reassured me. “It can be treated.” Possibly not macular degeneration then! Half an hour later we saw Dr V. I liked him immediately. He was down to earth, warm and friendly, easy to lipread and patient when I needed information repeated. He reassured me this was completely different from my worst fear, macular degeneration. He showed us a cross section photograph of my retina, clearly showing the hole and explained how I got it. As we age, the gel in our eyes shrinks. Usually this happens slowly and is not a problem but sometimes it happens too fast and tears a hole. If nothing was done, he said, my peripheral vision would be fine but my central vision would deteriorate until I was unable to read. Me, an avid reader, knitter, crochetter, sewer, Sudoku and crossword puzzler, unable to do any of those things? Unable to communicate easily? My heart trembled. My eyes’ complexity exacerbated the situation. Born with a turned left eye, I have twice had eye straightening surgery, my eyes don’t work together quite as other eyes do, and my right eye is dominant. Although my left eye’s vision is good, working alone it tires more easily and reading with only that eye is difficult. The only option was surgery which, Dr V said, should stabilise or improve my vision. He said the surgery was only about 40 minutes’ day surgery but I would have to spend a week face down afterwards. He repeated this twice to be sure I understood it. He explained that during the surgery they would take some of the gel out of my eye and put in a gas bubble and that the face down position was essential to keep the bubble over the hole. Surgery was scheduled for two weeks later. During those two weeks, John and I researched the condition, surgery and recovery. The Internet is a marvellous resource and I found helpful information. But some information turned out to be inaccurate, causing needless worry. The doctor’s staff sent information about equipment we could hire to help with face down recovery. Although nervous about the surgery, what worried me most was communication afterwards: how would I communicate if I had to be face down? Private hospitals, I knew, generally won’t provide interpreters, and even if they did, how would that work? Where would the interpreter be? Lying on the floor where I could see them? Nevertheless I asked. I sent an email to the hospital, explaining that I‘m deaf, my concerns and offering suggestions for managing post-surgery communication. These included an interpreter, providing post-surgery information before surgery, allowing John to accompany me before and after surgery, writing things down. The hospital replied promptly, ignoring the interpreter request but agreeing to the other suggestions and reassuring me that I wouldn’t be face down until after I had finished in the recovery bay and had eaten. I let the interpreter issue pass; there are times when even I get tired of having to advocate for everything and because I value my privacy, I often choose to use interpreters for health situations only when it’s absolutely necessary. So when I presented for surgery John and I were well prepared and so was the hospital. It helped that it was a small eye clinic rather than a large hospital and the nurse who cared for me in the recovery bay was the nurse who replied to my email. It probably also helped that I was the days’ last patient and there was no issue with John accompanying me. As I moved through the pre-surgery steps, each person asked me what procedure I was having. It was a question the clinic’s pre-surgery information advised would be asked repeatedly to prevent mistakes. When the anaesthetic nurse asked it of me she said, “What are we doing today?” I misread her and replied with a confused question: “What have I been doing today?” Why would she want to know that? John joked, “She’s been at the pub,” and I realised what she had in fact asked. We all laughed. Instead of a general anaesthetic, I had local anaesthetic and what is called ‘twilight sleep’, a drug that makes you very relaxed and drowsy. Near the end I became more alert and could see fuzzy shapes and what looked like two long thin needles. It was creepy. Later a hearing friend told me me that for her the worst thing about local anaesthetic surgery was being able to hear what was going on. I hadn’t thought of that. It’s an example of how good it is to be deaf sometimes. Back home, the face-down equipment was ready. A chair similar to those you sit and kneel on for neck and shoulder massage, with a donut shaped face rest. On the bed, the same type of face rest raising my face off the bed. To keep my back straight, I slept – surprisingly well – on a row of pillows. For six days I moved between the chair and the bed and occasionally sat leaning forward in an armchair, holding my face, my arms resting on with a pile of pillows. In the shower, at the table, walking around the house, everywhere, I pointed my nose at the floor. I drank through a straw and ate small, easy to eat meals. John stayed home, brought me cups of tea, rubbed my back, kept me company. It wasn’t totally necessary but it made my life much easier, less anxious. Friends asked to visit but I told them communication would be too hard in the first week. John and I talked only about essential things. Sometimes he signed where I could easily see his hands, sometimes he sat down and I stood up so I could see him. John bought a small TV and laid it flat on the chair’s tray below my face. The gas bubble blurred my vision and reading print with my left eye was too difficult but I could read TV captions for short periods. And so the week rolled by and on the seventh day we went to see Dr V.
“How are you?” asked Paul, the optometrist. “Actually I am pretty good,” I said. And I was. Although he couldn’t actually see the macula because the gas bubble obscured it, Dr V said everything looked good and I could stop the face down position. It was such a joy to look the world in the eye again and to drink tea from a china cup instead of a straw. Cabin fever overtook me. I had to get out of the house. John and I went to the shops. My eye was bloodshot, bruised and puffy. John worried that people would think he’d been beating me up. I didn’t care what people thought. In the supermarket I felt unsafe. Unable to see out of one eye or hear people coming up on that side of me, John frequently had to guide me out of people’s way. It became a joke for us. My sister Deborah came to Brisbane for a conference, staying overnight with us. “Did you get a text from Warren?” she asked. I told her I had, wishing me well for the surgery. “He’s getting soft in his old age,” I said to Deb. We laughed. Such a lovely brother! I couldn’t drive because the gas bubble obscured my vision. I’d been told it would take six to eight weeks to disappear. Gradually the bubble got smaller and I began to see over the top of it, but it made the light streaky and bounced around disconcertingly when I moved. One morning I saw a lot of black spots when I looked over the bubble. When I looked down through it, the spots disappeared. It was weird. By lunch time they were still there and I was anxious, reminded of the black squiggles. It was a Friday. John doesn’t work on Fridays. “Maybe we should phone the doctor’s rooms and ask if this is normal,” I said. John phoned and we were told to come in now. 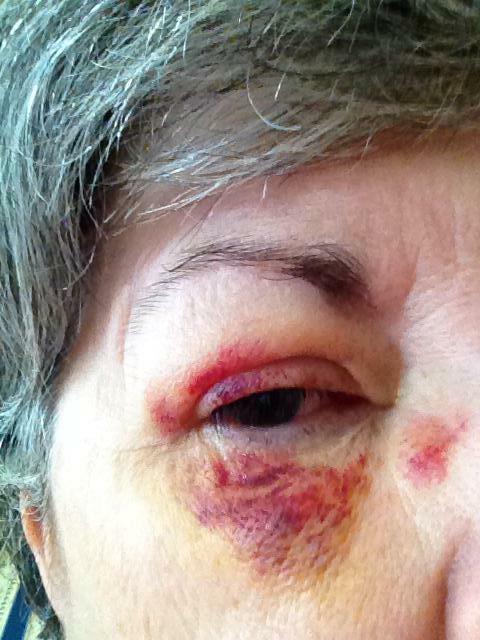 While we waited for drops to dilate my eye, we sat in the waiting room talking desultorily. John cracked silly jokes. Paul examined my eye thoroughly, carefully. Finally he said that everything looked okay. The retina looked smooth, there was no sign of a tear. The spots were just debris in the fluid, stirred up by the surgery and magnified by the gas bubble concentrating the light. For the first and only time in the entire saga, I suddenly was weepy, weak with relief. I hadn’t realised quite how frightened I’d been. A week later I had another checkup with Paul and Dr V, who told me that the hole had closed and all looked good. “You’re magic!” I said to the doctor. It was amazing that with the help of a gas bubble acting like a bandaid, my eye essentially healed itself. Seven weeks after surgery, Paul tested my vision and told me it was almost back to what it was at my September 2014 checkup with Kate. But although they now looked straighter than before, I could still see some waviness in straight lines. He explained that when the macula hole closes, sometimes the nerves don’t realign perfectly and my vision may never be as crisp as it was. It might improve a little more over the coming 12 months. The gas bubble got smaller and smaller. I started reading again about five weeks after surgery and driving again at six weeks. The bubble finally disappeared at exactly eight weeks. It almost felt like losing an old friend. And I am so grateful I’ve got an eye that works well again. Disclaimer: This is just my personal story. It is not medical advice. If you think you have a problem with your eyesight, seek advice from a medical professional.